A birthday is a perfect excuse for eating somewhere special – maybe even somewhere new. 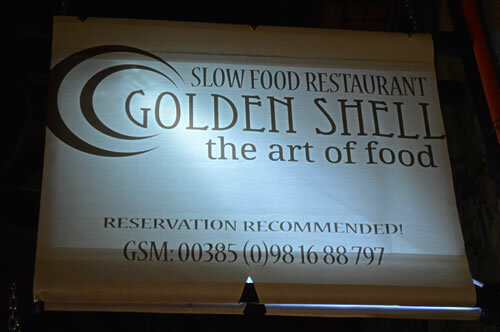 We’d read about the Zlatna Školjka (Golden Shell) in Hvar town, and how the chef is part of the “slow food” movement. Now that doesn’t mean you’ll still be waiting for your starter a couple of hours after ordering, but rather it implies the opposite of “fast food”. High quality local ingredients freshly prepared and beautifully presented. Descriptions of the food sounded wonderful, and we were intrigued by their menu – you can ask the chef to create your dinner from what you tell him you like and don’t like. A four course meal is a challenge, while six courses is an adventure! 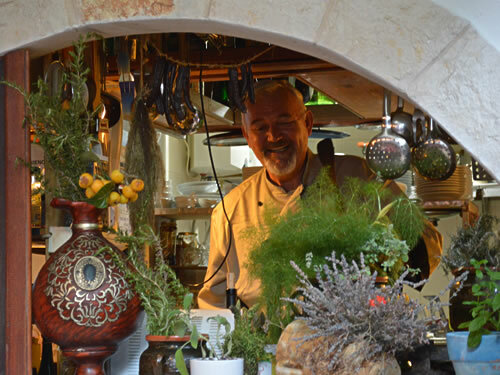 Owner Ivan Buzolić is an award-winning chef, well-known nationally and internationally, a respected judge of international culinary competitions, a local organizer of artisan events and gourmet festivals, and a great believer in slow food. He’s a WACS (World Asssociation of Chefs Societies) accredited judge – the first in Croatia, and a prominent member of the Association of Chefs of the Mediterranean and European Regions. 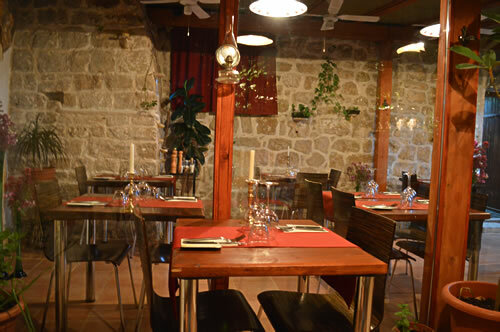 Žlatna Školjka is on Petar Hekorović, which you might think of as restaurant alley, one flight up from the waterfront behind the city wall. 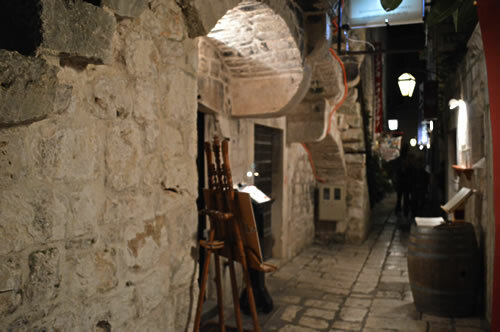 It’s not a large restaurant, but has a lovely intimate setting in the 15th century palace where Petar Hekorović was born. From the dining room there’s a view of the chef in the kitchen through an archway – quite deliberately to allow you to see your food being prepared. Naturally, we plumped for the six course adventure, and gave our preferences. I’m a vegetarian who eats fish, but I don’t like it to look at me, and nor do I like to have to prise it out of its coat. It should not look like it has just walked off the seafloor. In many local restaurants that can be a challenge for me, so it was a treat to put it on to the chef for a change! Himself, on the other hand, is what I would call an omnivore – he’s happy to eat pretty much everything – so I’m not sure that was really challenging for the kitchen at all! Now here’s a problem with not knowing in advance what food will be served – what wine to order? We discussed the dilemma with our waiter, who happens to be the son of the house and understands what is likely to come out of the kitchen. Together we decided you can’t ever go wrong with a Duboković red, say the 2718 hours of sun in a bottle, which is light enough to go with seafood, but robust enough to stand up to meat dishes too. 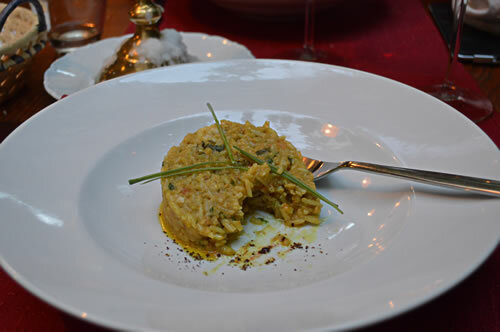 Truffle risotto – beautifully balanced flavour! I was a bit nervous about not managing to eat all the food that arrived as I don’t have a huge appetite – though I’d done my best to build it up with a walk around Velo and Malo Grablje earlier in the afternoon. I couldn’t possibly disappoint the chef by not finishing his lovingly prepared dishes specially for me! But I needn’t have worried, it was all just perfect. The appetizers were exactly what they should be – a very tasty selection and just enough to open your appetite and leave you wanting more. They were followed by a wonderful truffle risotto, then in my case by a fish course (not looking at me), and finally, a dessert of white and dark chocolate mousse. Simply delicious! All plates were duly polished and we had a second round of 2718 and a glass of Prošek. We enjoyed a truly special evening in the Golden Shell, and I’d encourage everyone to go and challenge Chef Ivo for yourself, doesn’t have to be your birthday! Golden Shell – the art of food! It makes for a fun experience as you taste each course and try to identify what’s in it! Very friendly folks and great food – made for a really special evening. You should definitely visit!